Revolution Nutrition™ Speed™ is an extreme high energy pre-training formula specifically designed to energize even the most experienced athlete! Speed™ is a pre-workout like no other, feel the intensity today! Speed™ contains key ingredients proven for their capacity to improve workout results so you can get the most out of each and every rep! Each serving of Speed™ contains 250 mg of active stimulants (Caffeine, Higenamine and Hordenine) to create the ultimate workout experience! Speed™ is so concentrated that a small scoop of 7 g is all you need for your body to experience an out-of-this-world workout! 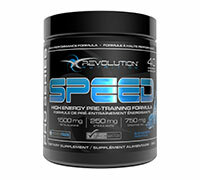 Speed™ is part of Revolution Nutrition™’s exclusive Flavor Match system. This system allows you to mix and match your favorite Revolution Nutrition™™ products together in the same shaker bottle according to the flavor of your choice! You can thus add Vitamin Cooler™ to Amino Isolate Splash™, BCAA Splash™, Bull Dose Pump™, Carnitine Cooler™, Whey Gainer Punch™, or Whey Protein Punch™! Mix 1 scoop of Speed™ in 200 ml of cold water. Drink prior to your workout. 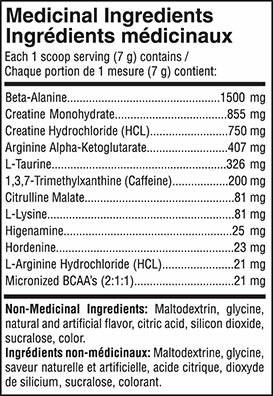 Do not exceed two (2) scoops within a 24-hour period. BCAA Splash™ also contains Citrulline Malate, which is proven to have a positive effect on muscular contraction efficiency. 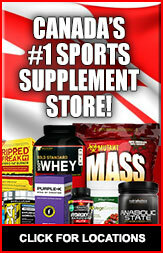 ** This will allow you to always be on top of your game!